The Man Booker Prize is one of the leading awards for fiction in the English-speaking world; it has brought recognition and readership to outstanding novels for over four decades. First awarded in 1969, it has been won by several authors with links to Asia, particularly those from the Indian Sub-continent interested in the legacy of colonialism - including most famously Salman Rushdie, for Midnight’s Children, in 1981. The organisers have just launched a fortnightly podcast, hosted by UK-based radio journalist Joe Haddow. There will be seven episodes going out on alternate Friday mornings from now through to the announcement of the winner in October. The mini-series will take as its focus the prize’s tagline, fiction at its finest. Coming up are a variety of interviews with well-known literary figures, publishing industry experts, and past Man Booker Prize winners. The first episode, broadcast last Friday, discussed Richard Flanagan’s 2014 winner The Narrow Road to the Deep North, set partly in a Japanese POW camp on the Burma death railway during World War Two, and exploring the lives of both the Australian prisoners, and the Japanese guards. The podcast is now available on iTunes and SoundCloud. You can join the conversation about the 2015 Man Booker Prize at @ManBookerPrize and #FinestFiction. About the book: During the Second World War India produced the largest volunteer army in world history: 2.5 million men. But, until now, there has never been a comprehensive account of the developments on India’s turbulent home front, and the nexus between warfare and India’s society. 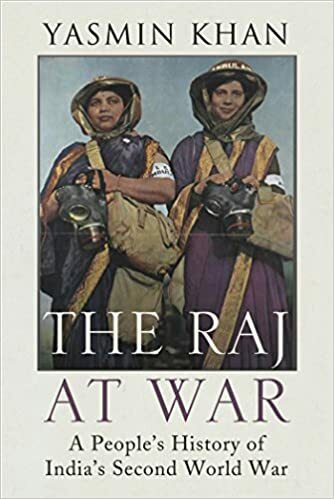 At the heart of The Raj at War are the lives and voices of ordinary Indian people. From the first Indian to win the Victoria Cross to the three soldiers imprisoned as traitors to the Raj who returned to a hero’s welcome, from the nurses in Indian General Hospitals, the labourers, prostitutes and families, their everyday testimonies reveal the great upheaval experienced throughout the land. These previously lost voices of Indian soldiers and civilians reveal the hidden and sometimes overlooked history of India at war, and show how mobilisation introduced seismic processes of economic, cultural and social change - decisively shaping the international war effort, the unravelling of the British empire, and India’s own political and economic trajectory. About the author: Yasmin Khan is a British writer and historian. Her first book, The Great Partition: The Making of India and Pakistan, won the Gladstone Prize in 2007 – the prize is awarded annually to a debut writer in the UK for a history book not focussed on British history. Details: Published in hardback and eBook by Bodley Head, priced in local currencies. There is no blog spot this week. Each week I invite the administrator of a relevant and interesting-sounding blog to write a paragraph. Do you run a blog you think may be of interest to readers of Asian Books Blog, and which you’d like to see featured here? If so, get in touch, preferably via e-mail - asianbooksblog@gmail.com. Thanks. I usually make a suggestion of one interesting Twitter account you may like to follow. But this week I’ve gone for a trio of accounts from PEN, the international association of writers, which promotes, worldwide, the freedom to write and the freedom to read, and which forms a global literary community celebrating literature. English PEN is at @englishpen. American Pen is at @PENamerican. PEN International is at @pen_int. In future, I will try to highlight PEN accounts within Asia. Are you a member of a book club you think may be of interest to readers of Asian Books Blog? If so, get in touch, preferably via e-mail - asianbooksblog@gmail.com - because I want to include a weekly book club spot on Sundays, to complement the blog spot and the Twitter spot.